With the winter solace behind us it must mean that summer is on its way. So I thought I would take a little time to reflect on the summer and the events of 2017. 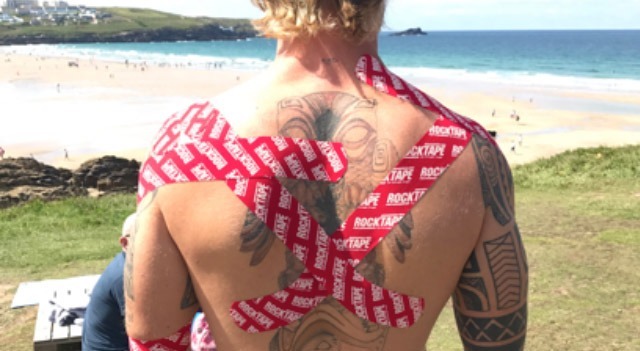 2017 was a great year for us at MSD Sport Therapy, with the support of Rocktape we worked at some of the biggest sporting festivals in the UK, one of which was Boardmasters. Boardmasters is all about the surf and beach lifestyle. Starting back in 1981 some of the best surfers in the world travel to Fistral beach in Newquay to compete in the UK’s biggest professional surfing contest. The contest forms part of the World Qualifying Series and is made up of international professional surfers all trying to earn their place on the World Championship Tour. Of course this means that we were working with some of the best up and coming surfers in the world. Although Boardmasters is primarily a surf contest, its also one of the biggest growing music festivals in the Uk which now attracts 50,000 visitors to its Watergate side to celebrate music and the surf culture. I’d like to say that we didn’t get involved in the partying side of things, but that would be a lie. The less said about the better….. haha!! 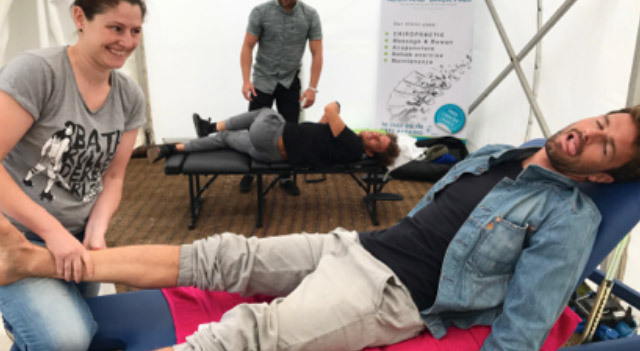 So over the 5 days we worked with over 260 athletes enlisting the help of Mike Noone and Alexander Goldberg at Kernow Chiropractic. We had set up in the Athlete area and started to work with the athletes. As you can imagine with surfers, there are a lot of tight Lats, upper traps and lower back issues. However, given how much performance surfing has progressed there are also a lot of ankle, knee and hip injuries. Surfers are surfing with an incredible amount of force while performing aggressive manoeuvres in the waves, as well as big aerial manoeuvres. These all leave the surfer with high impact landings, often putting strain on the lower limbs. This sits along side the fatigue surfers suffer from lying prone on their boards whilst in hyper extension paddling for the waves, as well as back out to sea to catch the next one. As a surfer myself, I know how much demand this places on the body. For these pro’s they have to get in the water several times a day to surf their heats. Therefore recovery between each 30min heat is incredibly important. 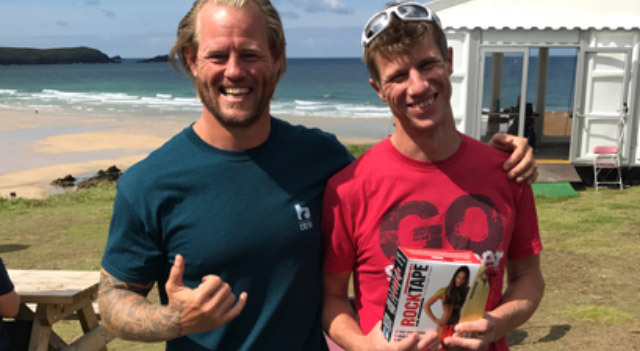 We were fortunate to have a visit from Rocktape UK medical director Paul Coker, who also brought us a load of lovely waterproof tape. If you participate or work with athletes in water sports, the H2O tape is perfect. It was ideal for our surfers and any athlete who competes in an environment where they will get wet (including heavy swaeating). Paul lives in Cornwall where he run his practice Move Cornwall . Paul is also a surfer so really understands the needs and the physical demands of a surfer. Paul kindly took some time out of his busy schedule to show us some of the best taping techniques to really help our surfers recover. An example of these taping techniques is show in the picture below. After seeing and spending some time with Paul (Who didn’t partake in the partying… just thought I’d drop that in there) we got to work. Every day was busy, surfers were lining up for treatments but with only two treatment beds available time was always against us. We prioritised those surfers who had heats coming up and worked on the other surfers in our downtime. It was non-stop from 8am until 5pm, when the contest finished each day. We also had to look after some of the pro Skaters and pro BMX riders, who were competing in a ramp contest being hosted on the headland. These guys go super hard and through themselves around with complete disregard for their health and personal safety, its brilliant. When the surf was flat you could watch these guys doing huge aerial manoeuvres that would see them being propelled 12-15ft in the air. But when they get it wrong, they feel it. Lots of injuries are sustained as the guys compete for a £9,000 prize purse (hence why they put so much on the line). The athletes were really grateful for the time and effort everyone put in during the contest. The Surfing GB, The World Surf League (WSL) were also full of praise. Even some of the WSL judges and contest organisers came for treatment to help them through a long week. Over all it was an incredible experience, both working with such great athletes, being surrounded by beautiful beaches and sunshine each day, working with the best Kinesio tape but mostly through living the beach lifestyle. Here are some pictures that we took whilst at Fistral beach and enjoying working at one of the best weeks of the summer.